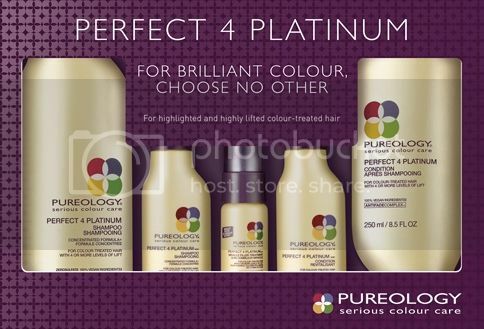 The Pureology Perfect 4 Platinum line is one of the very best lines that I have ever tried on my highlighted (and damaged) hair!!! It is specifically designed for color-treated hair that has 4 or more levels of "lift". While I am not sure if my hair specifically has 4 levels of lift, it is *heavily* highlighted, long, dry, and damaged. Most shampoos and conditioners are simply not moisturizing nor protective enough for my hair. Often, my hair becomes a tangled mess after washing if I do not use the correct products. 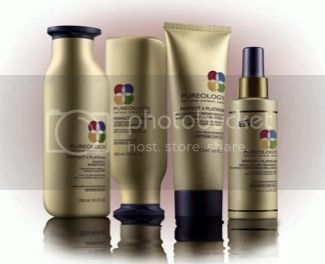 Pureology is a brand concerned with integrity and the environment. They practice sustainability, support water conservation, and promote social responsibility with Global Green. They are a sister company of my favorite brand Redken and their products are amazing! Over the years and even in recent months, I have found some really great products to help with my specific hair needs: my beloved Redken All Soft line (a favorite of mine for years), the Pureology Precious Oil line, and DermOrganic (another new fav) just to name a few. 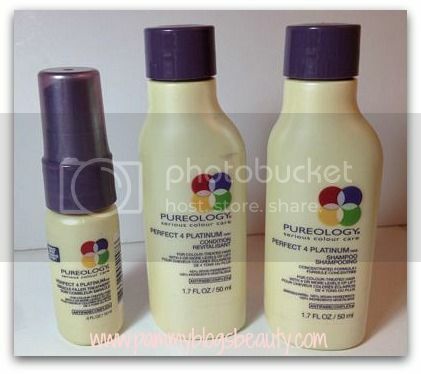 Well, this Pureology Perfect 4 Platnium line might just blow them all away! The results in my hair are hands-down amazing. I am so thrilled!!! To find out more about this amazing line, keep reading! So, why is this line so different and so effective? In a word: ingredients. These products simply have what heavily "lifted" blonde hair needs: Ingredients to penetrate the hair's cuticle to provide strength (keravis), Ingredients to soften hair and provide shine (lemon extract, coriander, etc), Ingredients to equalize porosity (the keravis "fills the gaps"), and Ingredients to help prevent fading (Purology's signature AntiFadeComplex). Plus, the line has no sulfates (ingredients known to strip color). What hair types benefit from this Perfect 4 Platinum line? As mentioned previously, this line is for hair that is color treated with 4 or more levels of lift: So, very light blond hair. If your hair is not heavily lifted and not hair seeking super duper moisture and repair, than this line will likely be way too heavy for you. These products are extremely thick, rich, and nourishing. If your hair is normal or color treated but not damaged, then these products might just weigh your hair down. Plus, you would not get the full benefits of the keravis protein (which fills in the "gaps" from the color lift...if your hair is not lifted, you will not have these "gaps" to fill. Does this make sense?). This line reminds me somewhat of a line that I used years ago when my hair actually was platinum blond, Goldwell. So, if you are a fan of the thick and rich Goldwell shampoos and conditioners, then you might really like this Pureology line! The Perfect 4 Platinum line smells *amazing* too! Each product smells slightly different and totally lovely (light, fresh and almost creamy type scents). The shampoo has a slight light blue tint to it. I am not sure if this is a corrective tint or not? I do know that blue or purple tones can work to counteract brassiness in platinum hair. Perfect4Platinum delivers concentrated keravis to replenish and plump the keratin gaps, equalizing porosity. Chamomile extract improves overall suppleness and softness. The lemon extract clarifies and smoothes the cuticle for enhanced shine. Finally, coriander creates a mirrored surface to magnify shine...signature AntiFadeComplex® delivers free radical damage protection for a longer lasting hair colour. If you have heavily highlighted or heavily lifted colored hair, I highly recommend this line! It really transforms my dry and damaged hair into silky, soft, shiny, tangle-free, soft hair! I really love it! I have not tried the Reconstruct Repair treatment yet, but I would love to! Everything else in the line I totally love! Do you have heavily highlighted or highly lifted color treated hair? What products do you like to use?